I strongly believe (at least for very early stage technology ventures) that you will get diminishing returns and arguably negative returns once you get past an initial threshold of team, product, market and financial diligence. There are so many unknowns at this stage and the only known is that the business model is going to change at least once, or in the current most overused term in the Silicon Valley, there will be a "pivot". It turns out the statistics related to returns were from an oft cited study on returns to investors in angel groups sponsored by the Angel Capital Association with research by Robert Wiltbank at Willamette University. The research did show that higher returns were earned by investments where more diligence was done. However, the bar was set very low at 20 hours as the determinant whether high or low diligence was performed. The average number of angels per investment was 6, which pegs the average time at just over three hours per individual. This could include 2 short meetings and a couple of phone calls. Not exactly extensive diligence. This feels about right for an early stage angel investment and no reason that the process needs to drag out for months and even weeks. The key to getting deals done and investing in the best deals is the ability to make quick decisions and this is where angel groups have deservedly earned a bad rap. This brings me back to a post a wrote about a year ago titled "Would a Dart Board Provide Better Returns?" I wrote this right after I had read about a new fund, Right Side Capital, that planned on investing in 100 companies a year without ever meeting the team or vetting the idea. Instead, they are going to rely on an algorithm to select companies. The formula will be based on the founders' experience, schools they attended and other background information to gauge the likelihood of success. So, after my initial reaction of "Are they friggin serious? ", I became intrigued by what they were doing and spent several hours with the team and looking into their research. If you want to skip to the end of the story, I ended up becoming an adviser and investing in the management company. Black Swan Theory, according to Taleb, almost all major discoveries and undirected and unpredictable. In the context of angel investing, the best way to play is to diversify across a broad spectrum of technologies and geographies. Since it is extremely difficult to predict, this will give the best chance of hitting the winners. Not totally surprising, some of the early backers of RCSM are professional poker players, who obviously know a bit about playing the odds. I'm hoping this roll of the dice comes up 7's. Keep up the good work. I strongly believe at least for very early stage technology ventures that you will get diminishing returns and arguably negative returns once you get past an initial threshold of team, product, market and financial diligence. There are so many unknowns at this stage and the only known is that the business model is going to change at least once, or in the current most overused term. The written style is very prompt and the highly practical manners. Love the comments and common sense that resonate within them. I've been working within the sphere of startups and angels for a couple of years in Vancouver, BC and it's been an interesting experience...a story for another day. 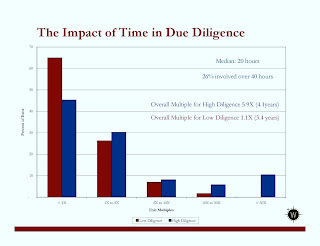 I appreciate your thoughts here on Due Diligence as it's been a question of mine for a few months now. One thing I've noticed, DD certainly seems to be an oft used way for angels to avoid/stall or manipulate the process of making a decision.